Resistance bands are a convenient home and travel workout tool. They’re light, inexpensive and take up next to no space. As long as you have something sturdy to attach the bands to, you can use them for an effective chest workout. Most chest exercises are variations on a pushing theme and usually involve the triceps as well. The chest press uses the pushing motion that is characteristic of almost all chest exercises. The chest press works your chest and your triceps. Loop the resistance band around a sturdy object at shoulder height. Stand with your back to the anchor, holding one end or handle of the band in each hand. Press the band forward until your arms are extended straight, but not locked, in front of you. Keep your hands at shoulder height as you bend your elbows, letting the band’s resistance pull your hands out and back. Stop when your elbows are even with your shoulders. Press forward again against the band’s resistance. Repeat 12 to 15 times. Punches work the same muscles as a chest press, albeit in a more dynamic fashion. Because they combine speed and strength, punches help you develop powerful chest and triceps muscles. Set up the resistance band as described for the chest press. Hold the left side of the band steady, close to your chest, as you punch your right hand forward against the band’s resistance. Keep the punch at chest level. Bring your right hand back against your body. Hold your right hand steady as you punch out with your left. Continue alternating left and right punches for 12 to 15 repetitions on each side. Single-arm crossovers mimic the motion of a cable crossover, one arm at a time, minus the need for an expensive and space-gobbling cable machine. This exercise neatly takes the triceps out of the movement, making your chest muscles work harder. Attach one end of the band to something sturdy at head height or above. Hold the other end of the band in your right hand. Stand with your right shoulder toward the secured end of the band. Take a step to the left until you feel tension on the band. Pull the band down and across in front of your body toward your left hip. Squeeze your abs to keep your torso from rotating as you do this. Slowly release the contraction, letting your hand track out and up until your elbow is even with your shoulder. Pull down to your left hip again. Complete a full set of 12 to 15 repetitions on your right side before switching to the left. 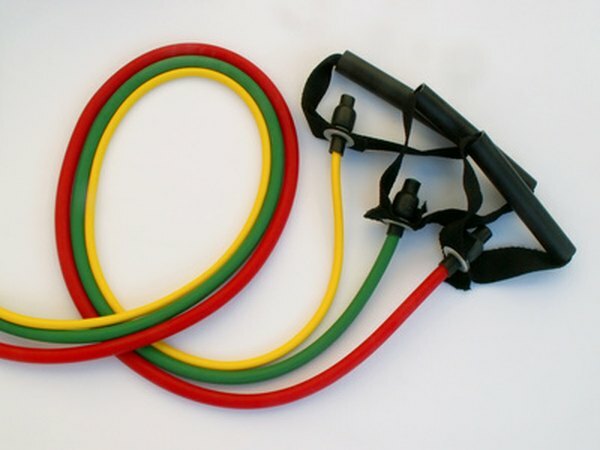 Using a resistance band for push-ups makes an already challenging body-weight exercise even harder. Like the chest press, push-ups work your chest and triceps. Loop the resistance band around your shoulder blades. Assume a push-up position, supporting your body weight on your hands and toes. Place the ends of the band underneath your hands, gathering in slack until you feel tension in the band. Lower your chest toward the floor. Press your chest up against the band’s resistance. Lower your chest toward the floor, then press up again. Repeat eight to 12 times.